Self-adhesive label materials producer UPM Raflatac has two new lightweight solutions for wash-off logistics labeling applications. The new materials include Thermalite Top+ PEFC and Thermalite Eco+ PEFC. They can be paired with the RP45 LW adhesive to adhere permanently to even rough or patterned surfaces of the label. UPM’s new materials can be used for effective labeling of plastic pallets, crates and other containers. They will also help to sent back into circulation over and over again with minimum effort and maximum efficiency. Thermalite Top+ PEFC is a BPA-free direct thermal label face developed for wash-off applications. With better image stability, the new thermal label shows enhanced functionality in both chilled conditions and during hot summer transport. Thermalite Eco+ PEFC is a light thermal label face that is developed for wash-off applications. Due to the reduction of grammage, this new material is said to be more resource efficient than standard products. UPM Raflatac logistics segment manager Jouni Iiskola said: “These products are lightweight, making them much better for the environment. The company produces specialty labeling solutions for address labels, shipping and mailing labels and related applications. Earlier this month, UPM Raflatac has collaborated with wine industry leaders on sustainability at Vinitaly 2017 wine exhibition. The company partnered with Italian wine producer Cielo e Terra and natural cork supplier, Amorim Cork, for promoting sustainability in the wine industry. 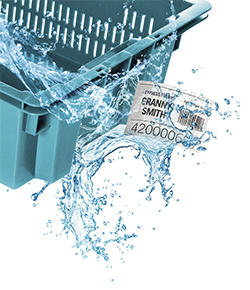 Image: UPM Raflatac’s new lightweight solutions are developed for wash-off logistics labeling applications. Photo: courtesy of UPM Raflatac.